Henry, son of William Henry & Caroline Bottle, was born at Hawkenbury, Kent, England on 9 March 1892. Mr Osborn believed he was the first from Rakaia to have been killed. Henry’s last New Zealand address was given as care of C. Hallards of Temuka. 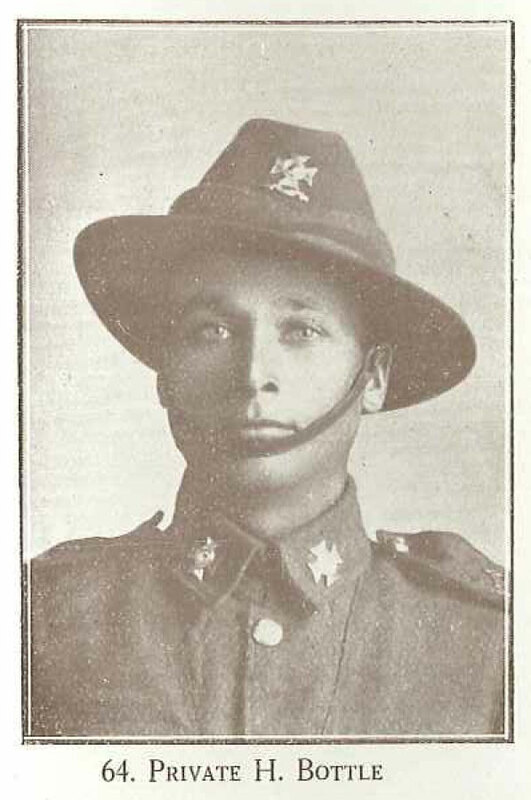 He enlisted in the Canterbury Infantry Division on 12 December 1914 and served until 14 February 1915 when he embarked from Wellington on either the Maunganui, Tahiti or Aparima with the 3rd reinforcements for Suez, Egypt arriving 26 March 1915. He was described on enlisting as being aged 20 years (but his birth date was given as 1892), of fair complexion, chest 33 inches, weight 127 lbs, height 5 foot 6 inches, eyes blue, hair dark brown, and teeth good. Henry was wounded whilst landing at Gallipoli and died on board HMHS Galeka and buried at sea 20 May 1915. He is commemorated on the Lone Pine Memorial, reference 74. He was awarded the 1914-1915 Star, British War Medal and Victory Medal which were sent to his father in England along with a scroll and plaque at wars end.